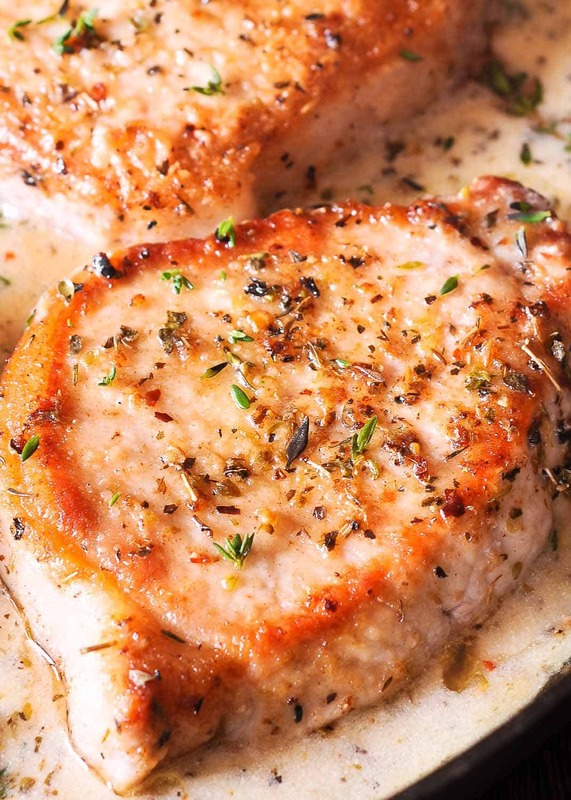 Delicious Boneless Pork Chops in Creamy Garlic & Herb Wine Sauce One Skillet dish is low on carbs, easy to prepare and ready in less than 30 minutes! Made with dry white wine, juice of a fresh lemon, garlic and thyme, these pork chops are packed with flavor and so juicy! Pork chops aren't like pizza — where even bad pizza is still good pizza. Pork chops that are overcooked or under-seasoned aren't especially awesome. This recipe (from What's in the Pan?) helps walk you through some of the pork-chop pitfalls one might encounter. From little things like starting with room-temperature meat so you get an even cook or using thicker chops to ensure success, all the notations are included in this quick 30-minute recipe that has a tasty wine sauce to go with it. What's that? You're not a wine drinker? No worries, there are multiple substitutes at the end of the recipe to cover exactly that. If you've been pork chop–phobic, then this is the recipe to cut your chops on (see what I did there?) and whip up a delicious meal that the entire family will chow down on. 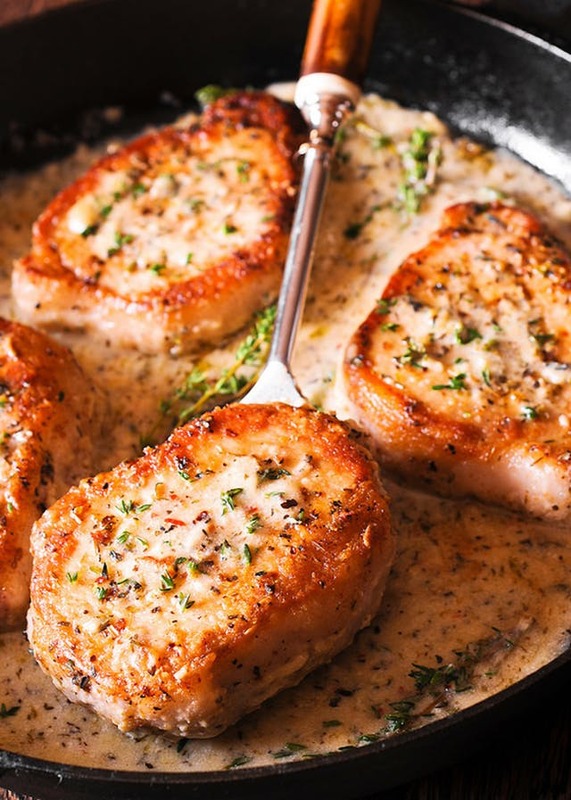 Delicious Boneless Pork Chops in Creamy Garlic & Herb Wine Sauce One Skillet dish is easy to prepare and ready in less than 30 minutes! Made with dry white wine, juice of a fresh lemon, garlic and thyme, these pork chops are packed with flavor and so juicy! In a large bowl, whisk together flour, garlic powder, onion powder, Italian seasoning and season generously with salt and pepper. Dredge pork chops thoroughly in dry mixture, then heat 2 tablespoons butter in a large skillet over medium-high heat. Once hot, add pork chops and sear them by cooking for 3-4 minutes per side for a total of 6-8 minutes. First side is cooked on medium high, but when cooking on the second side, reduce the heat to medium. Remove pork from heat and transfer to a plate. Cover to keep warm. Return skillet to heat, add 2 tablespoons butter and minced garlic and cook for 1-2 minutes on medium heat. Add flour to the butter mixture and start pouring in wine while still on medium heat - about 1 minute. Next squeeze lemon into the pan, add chicken stock and heavy cream. Add fresh thyme and Italian seasoning, season with salt and pepper (to taste). Simmer for 2-3 minutes. Taste the sauce and add more seasoning, if necessary. Reduce heat to low and return pork chops to pan. Depending on the thickness of your pork chops, you might just need to heat them up a bit to make sure they are done. Drizzle some of the sauce over pork chops and reheat on low for 2-3 minutes or until pork chops are done. 0 Response to "Pork Chops in Creamy Garlic Sauce"